Sri Lanka was the second hardest hit country when the December 26, 2004 tsunami struck. Over 35,000 people were killed and over 21,000 were injured. The tsunami memorial at Peraliya honors the site where more than 1700 people lost their lives when a tsunami wave derailed a passenger train. Construction was funded by the Japanese. 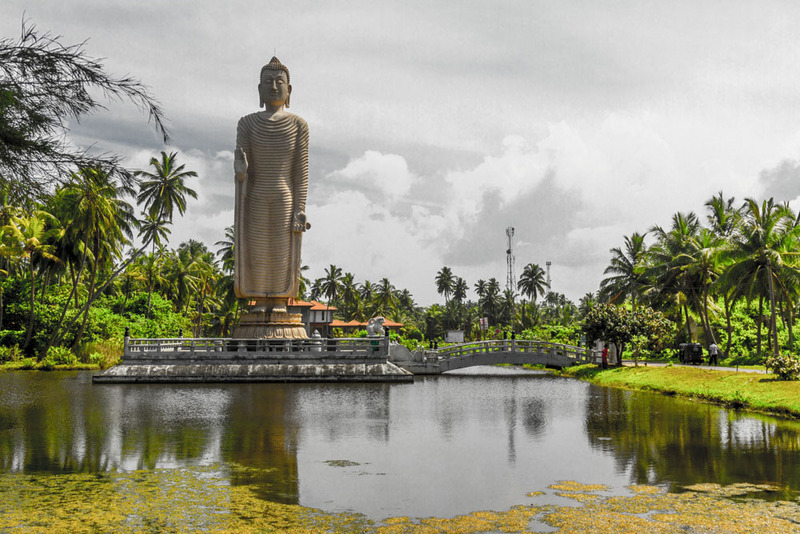 The memorial is located on a small island which is part of a Buddhist temple (vihara). The town of Peraliya was also destroyed. The memorial is on the southeast coastal road between Colombo and Galle. The Buddha statue is a replica of one of the Bamiyan Buddhas destroyed by the Taliban in Afghanistan in 2001. A beautiful memorial and photo. I feel for those who experienced such loss. Thanks. It was strange to be in such an idyllic place and remember the pictures of the destruction.